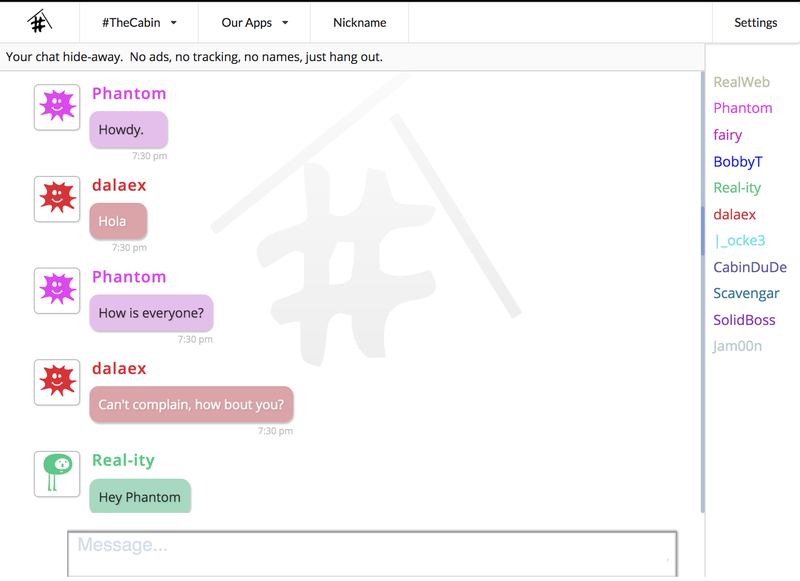 #TheCabin - Your home on the internet. There used to be chat rooms where you can meet new friends and be a part of a community with people from all over the world.| There used to be places before Facebook and Twitter where you could meet new friends without giving up your identity in return. | There used to be communities you could join that only cared about you as a person, and not about the life you fabricated in photos. One such place still exists. There's still a welcoming place where you can meet people anonymously with no ads and no giving up your privacy. Why you should make #TheCabin your new online home? Are you sick of social networks needing to know everything about you? That's not necessary here. Do you remember the internet being simpler and more fun? It still can be. If you don't know where to go to make some new friends, try here. We're a community that's over 20 years old that participates on a platform that existed before the web itself. We're not trying to make money, so we're not trying to make money off of you. Real people you interact with, not just "friends". WHAT DO PEOPLE SAY ABOUT #THECABIN? Press play to hear it in their own words. "#TheCabin is all about individuality. You can express yourself in a welcoming place." "You come as you are, which is awesome." "When I discovered #TheCabin it brought me to a simpler place." "They bring it back to the basics, and honestly, it's refreshing." ...plus many other ways to visit us. Join now by just selecting a nickname.